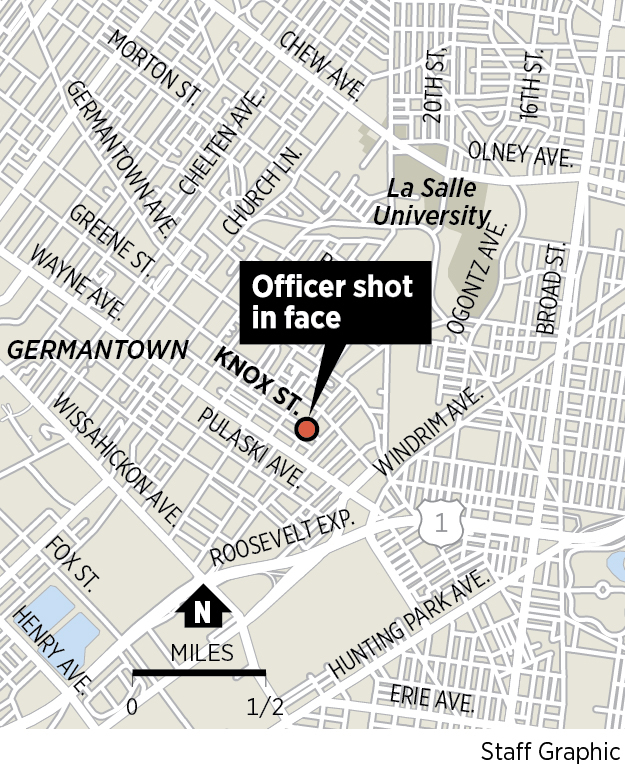 Police investigate the shooting of a police officer on the 4800 block of Knox Street, in Philadelphia, Monday. 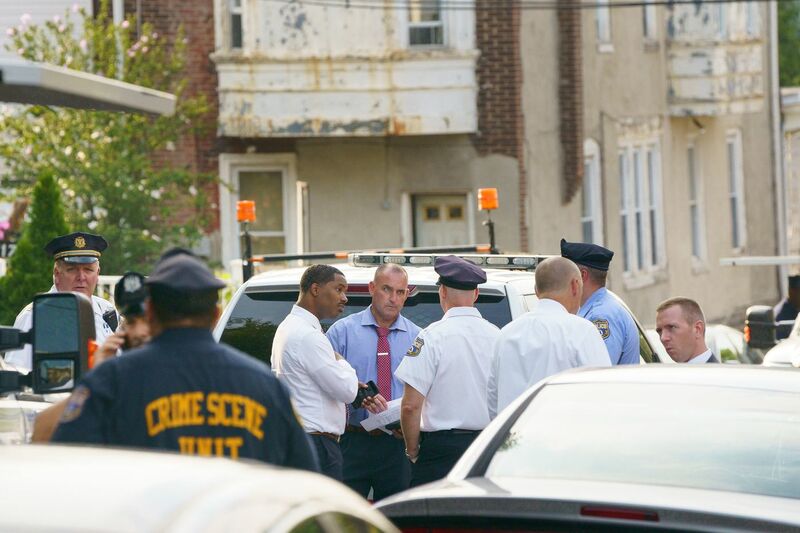 Philadelphia police shot and killed a 59-year-old Germantown homeowner and wounded his wife Monday when a SWAT team showed up at 6 a.m. looking for his grandson and the man mistook them for intruders and opened fire, hitting one officer in the face. The officer, Jaison Potts, 49, was able to walk into Temple University hospital but had to be sedated and was listed in critical condition. Ross said Monday night that a bullet remained lodged in Potts' jaw. Ross said officers knocked and announced themselves several times before seeking to enter the home to search it and question the man's grandson, 20, about potential weapons violations. Ross said a television was on inside the home, so it was possible that the homeowner did not hear the warnings. The commissioner called what happened in the the early-morning hours "an all-out, absolute tragedy." It was the fifth time in 2018 that city police have shot someone and the second fatal shooting, according to police statistics. Potts, a 20-year veteran of the force who is married and has three children, is expected to survive but will have a long recovery. He was expected to undergo surgery Tuesday, Ross said. Mayor Kenney, who went to the hospital where Potts was being treated, said the officer was supposed to start vacation after his shift ended Monday. Police Commissioner Richard Ross and Mayor Kenney speak to reporters outside Temple University Hospital after Officer Jaison Potts was shot in the face while trying to execute an arrest warrant. When they did not receive a response, they broke through a front door, Ross said. Inside, the man had grabbed a handgun, and thinking they were in danger, urged his wife to flee out the back of the house, Ross said. Potts' partner, whom Ross did not identify, fired a shotgun five times in return, Ross said. At least one round hit the homeowner. The man's wife was struck in the stomach by a shotgun pellet that ricocheted before striking her, Ross said. She also suffered back injuries trying to flee the house. The homeowner and his wife were taken to Einstein Medical Center. He was later declared dead. She was listed late Monday in stable condition. Ross said SWAT officers serve around 300 warrants a year and had not fired a shot since 2015. Monday's shooting was "just a tragedy," he said. "It's an absolute unfortunate circumstance all the way around." Under department policy, the officer who fired the shots will be placed on desk duty pending the outcome of an investigation by the Police Department's officer-involved shooting unit. Correction: A previous version of this story misstated why police had come to the home. Officers had a search warrant, not an arrest warrant.